Today was the community garden plot kick off! Well, it got off to a slow start. Three of us plotters ended up having our plots moved. (Going with the “plotter” title as it sounds kinda snappy, or maybe “planting plotters”, as community gardeners sounds a bit too formal for my tastes.) Apparently, the county ended up thinking our original plots were a bit too small due to cut off edges caused by a fence line. So, they moved them to where the wood chips were to go and put the wood chips somewhere else. Well, to my extreme joy, my new plot is a nice 10 x 20 rectangle the is right up against a straight fence. Not only that (yeah, it gets better! ), it is perfectly angled for lots of sun (to the joy not only of me but certainly my soon to be planted tomatoes, peppers and eggplants given they are heat and sun lovers). Well, my joy was temporarily tempered when I arrived today to discover that when the wood chips were moved and my new plot was created, the county left the plot untouched as they had already tilled all the other spots before they decided to move the three plots. So the three moved plots, including mine, were hard packed compared to all the other plots that had light fluffy tops. When I arrived today, the plotter next to me looked like she was going to pass out. She was also a tad bit exasperated. Why I thought? Then I looked down at her plot. Clay. Lots of clay. Hard big lumps of clay. She said she was on day three and still working to get the soil properly worked up. She was doing it by hand with a fork and she was also finding trash and big rocks along the way as she dug up the clay. She wryly suggested that we set up a potting wheel and start throwing clay. But as I mentioned, my joy was only temporarily tempered. Say, maybe tempered for five or so minutes. Because then I got very excited. I decided that this was the true deal. Not only was I getting a new community garden plot, I was getting one that had yet to be worked at all. I would look at it as an adventure, like a pioneer coming to raw land and working it until it produced food for the table. So I decided I was in fact lucky that the country forgot to fix my plot. I would fix it myself. I would have this great life experience. A true urban gardener with a pioneer experience. Well, I would as soon as I figured out what tools to use and how to do it. I also decided a team would be more productive as I did not have three days like my neighbor plotter to dig up my plot. So after a trip to the hardware and garden store, my reinforcements arrived (Patrick and Calvin). With our newly acquired shovel, fork and cultivator, we went to work. Calvin had a child size hoe and child size garden gloves. We worked it until it got dark. 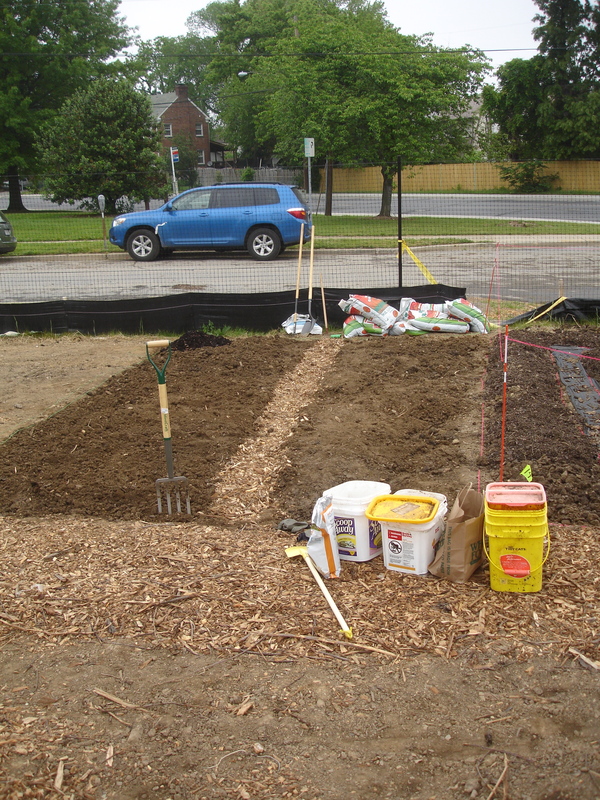 So tomorrow we will give it a few more hours of digging and then can add some compost and other organic material. Calvin and I have been discussing how to organize the plot. I am partial to trying out a square foot garden plan. Calvin wants rows. So we will sort it out tomorrow and I hope that we will get some things planted. Woo hoo!